As part of their Gothic season the BBC are repeating their 1977 supernatural drama series tonight, imaginatively titled Supernatural. A series of independent stories linked by a wonderful premise, in the style of the Amicus portmanteau films. The premise here is a Victorian club called The Club of the Damned, to gain entry a prospective member must tell the members a terrifying tale. If it is not considered scary enough then not only is the prospective refused membership but he is put to death. Sounds great, doesn’t it? Sadly the whole thing is rather mediocre, poor direction, stilted dialogue and those very mannered performances that the BBC thought was the way everyone acted who existed before the 20th century. 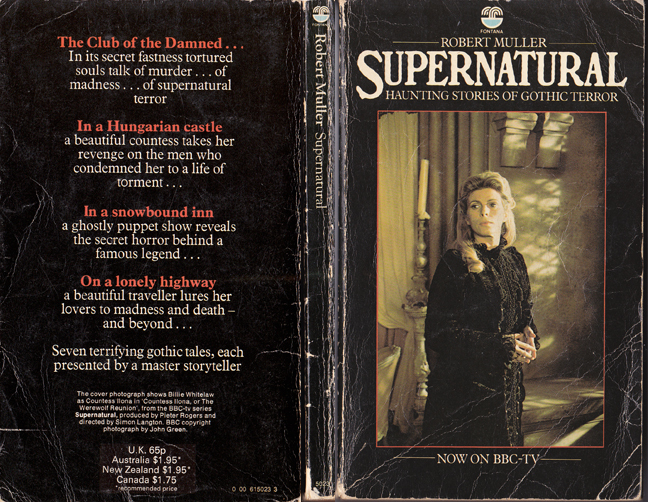 Published in 1977 by Fontana, the seven stories are adapted from Robert Muller’s screenplay by a selection of authors, including the prolific Rosemary Timperley who had many stories in the Pan horror anthologies. Shame I missed this, I’m a sucker for mediocre supernatural portmanteau teleplays in general. Should I mention I’m a huge fan of the Amicus films too at this point? What can I do though, I don’t have access to TV any more and so occasionally have to sacrifice these little guilty pleasures for the lack of anything to watch them on. Mind you, it gives me more time to read, write, listen and think without constant corporate bombardment which is no small compromise. Keep writing my friend and I for one will keep reading. Cheers, unsubscriber! Aaah, the Amicus portmanteau films, they hold a special place in my heart. Which reminds me, I must post my review of the novelisation of Dr Terror’s House of Horrors.